When teeth don't erupt properly, they can cause painful problems with your bite. Normally, a tooth will begin developing under your gum and then push up and out of the gum when it is ready. This process of emerging from the gum—called “erupting”—happens once while you are a baby, and then again when the baby teeth fall out and are replaced by permanent teeth. But sometimes a tooth doesn’t ever fully emerge from the gum, or it doesn’t emerge at all. This is called an impacted tooth. This failure to erupt happens most often with the wisdom teeth—the molars in the back of the mouth that usually erupt during the late teens or early twenties. But teeth don’t just stay under the gums because they’re shy. Usually there’s something keeping them from erupting. Perhaps the other teeth are overcrowded and don’t leave room for new teeth to come up. Or, usually in the case of wisdom teeth, the jaw might be too small for new teeth to emerge in the back. What’s the problem with impacted teeth? Impacted wisdom teeth are often painless—you might not even know if you have one. However, in some cases, the impacted tooth can inflame the gum and cause pain. An impacted tooth may also push against the teeth around it, causing alignment problems in the bite. Another possible consequence of impacted teeth is pericoronitis. Pericoronitis occurs when a partially erupted tooth traps food and other debris around it, causing inflammation in the gums and decay in the surrounding teeth. This is most common for young adults who have impacted wisdom teeth. If left untreated, pericoronitis may spread and cause swelling and infection in the cheeks and neck. Symptoms of pericoronitis include swollen gum tissue, swollen lymph nodes in the neck, difficulty opening the mouth, a headache or jaw ache, and an unpleasant taste or odor in the mouth. How is an impacted tooth diagnosed? A dentist can sometimes identify an impacted tooth by simply examining your mouth. Red, swollen, and even draining gums surrounding an impacted tooth can clue your dentist in to the presence of a problem. An x-ray can also confirm or reveal an impacted tooth. How is an impacted tooth treated? Unfortunately, there isn’t much you can do yourself to prevent or treat an impacted tooth. If an impacted tooth isn’t painful, it might not cause any problems. If you do feel pain, you may be able to temporarily relieve the it with over-the-counter pain medications. Rinsing the mouth with warm saltwater can also soothe the gums. However, the only complete solution to a painful impacted tooth is to see a professional who can extract it. This surgery will be performed under anesthesia. After surgery, swelling and tenderness are common but should go away within a few days. Extraction of impacted teeth has a high success rate and complications are rare. Once the tooth is gone, the pain will be gone too. Extraction of wisdom teeth is usually most successful when the patient is under twenty years old, since the roots of the teeth have not had as long to develop at this point. Often, all four wisdom teeth are removed at once to minimize the number of surgeries and to prevent problems and pain in the future. When a tooth other than a wisdom tooth is impacted and that tooth is necessary for full functionality, other kinds of surgery and orthodontic treatment may be needed to get the tooth to erupt and move it into place. 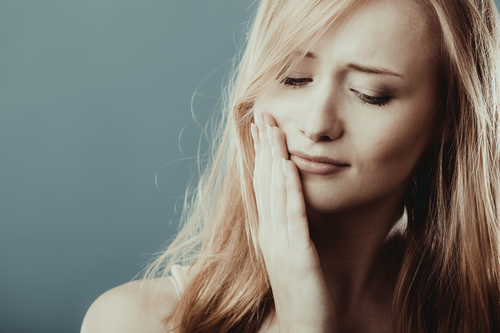 If you have symptoms of an impacted tooth or are suffering from pain in your mouth, don’t hesitate—schedule an appointment with Dr. Trujillo, periodontist at Phoenix’s Arizona Periodontal Group!